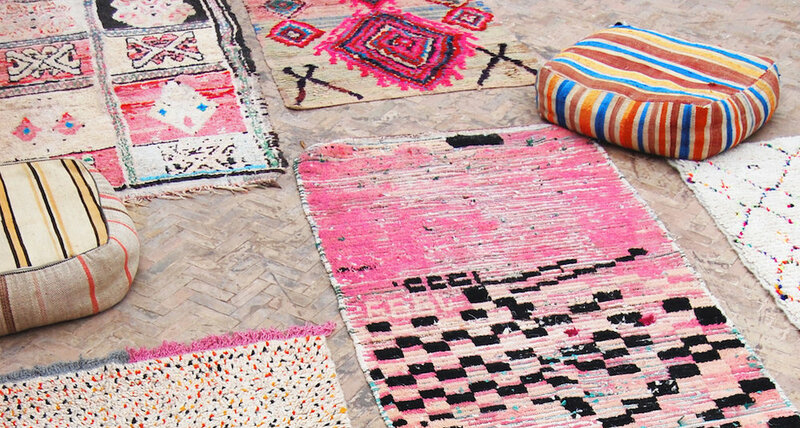 Berber rugs – the type that most people are referring to when they reference Morocco - have recently surged in popularity, popping up everywhere from candid home snaps on Instagram to the pages of high end interiors magazines. They’re fast catching up with the house plant as a ubiquitous must-have item, usually paired with white walls, lots of textiles, and lush foliage. Through my day job I’ve recently spent quite a bit of time working with vintage rugs, which has given me some insight into the history behind these treasures and the various different types available. I thought I’d condense some of my knowledge here and share with with you! Berber rugs have been around for literally hundreds of years, so why so popular all of a sudden? Their rise is thanks in part to the surge of ‘tribal chic’ – the laid-back, bohemian interiors popularised by bloggers and Instagram stars such as Justina Blakeney and SF Girl by Bay. It’s a far cry from the stark, minimalist interiors that were popular when I first became aware of interior design in my mid-teens, and the best thing is that it’s accessible to all – pretty much anyone can afford a few house plants, cushions and a tin of white paint. “But vintage rugs are ridiculously expensive!” I hear you cry. Yes, the truly special treasures that antique dealers go hunting for will set you back thousands. But there are loads of independent sellers who are picking up genuinely beautiful pieces for around the £200-500 mark. Originally made by Berber tribes to keep their houses warm, most of these rugs will have been hand-loomed up in the mountains of Morocco by groups of women. They’re generally long and skinny in shape, as they’re designed to fit the narrow rooms of Berber houses – not our big square ones! Traditionally they would be made using the wool of sheep local to the makers, but with the changing face of our planet the tribespeople have recently started to incorporate other materials into the mix (more on that later). There are several different styles that have risen to prominence at around the same time, each with its own distinct personality: Beni Ourains, Azilals and Boucherouites. Beni Ourain (also written Beni Ouarain) are the most ubiquitous, and the sort that jumps to most people’s minds when Moroccan rugs or tribal style is referenced. Plug ‘Moroccan rug’ into Pinterest or Google images and you’ll get pages and pages of Beni Ourains. This is the most consistent of the three in terms of design: Benis are made from a cream, light brown or off-white background with dark brown or black geometric patterns across the surface. The weavers typically tend to stick to diamonds or straight lines, but you will occasionally see them break rank and go off into crazy zig-zags! Azilal rugs are similar to the Beni Ourain, with the added elements of colour and storytelling. These are my favourite, as they’re so full of personality! Again, they predominantly use a cream or off-white backdrop, which is decorated with colourful yarn in diamonds, squares and other patterns. . If you look closely at some Azilals you can see stories playing out across their surface, in the form of stick figures, animals and other symbols. Some of the recent ones even incorporate little drawings of cars. Azilals are a visual feast; I never get tired of looking at them. Boucherouites are the wild card of the group, and a much more recent invention than the other two mentioned here. They’re made by the very same tribes but in a new style, developed recently as a result of socio-economic changes in Morocco. According to this article from the New York Times in 2010, the decline of the nomadic lifestyle has led to a decrease in wool production from shepherding. At the very same time, Moroccan style and culture has caught the eye of homeowners worldwide, and demand for authentic rugs has soared – prompting the local people to adapt their methods to keep up with the Western appetite for their creations. Swapping wool for scraps of cotton or synthetic fabric has allowed the Berber tribes to keep creating rugs, and earning a living, in the face of this scarcity of materials. It has also given rise to an entirely new breed of Moroccan rug which wouldn’t otherwise have existed, and which has its own benefits over the more traditional styles: the Boucherouite. Since cotton and nylon fabric doesn’t have such a strong tendency to shrink, Boucherouite rugs are often sold as machine washable. This makes them ideal for use in parts of the house where they’re likely to get stained, such as hallways, kitchens, kids’ bedrooms and bathrooms. These rooms were previously off-limits for Berber rugs, because let’s face it – no-one’s going to drop hundreds of pounds on a vintage piece that’ll be ruined the second someone slops a cup of tea over it. Which rug is right for me? There’s no ‘best’ option out of the three - you just need to choose based on your own personal tastes and the type of room you’re buying for. Living rooms and bedrooms are good places for Benis and Azilals, as they’re less likely to get ruined – choose Beni if you like quite pared-back interiors, or Azilal if you’re into colour. Upstairs hallways (away from muddy shoes) are also good for these two – if you’re buying very ancient vintage from the 70s, this may be the only place you can logically put it thanks to the long, thin dimensions. For high-traffic or messy spots like doorways, kitchens, kids’ bedrooms or bathrooms (yes, people do really put these in bathrooms – just look on Pinterest) a Boucherouite would be better. If it gets dirty, just whack it in the washing machine. Most important of all: take your time, and choose carefully. These rugs are steeped in history. With a little research and consideration, you’ll be rewarded with a much-treasured possession whose story you can enjoy for years and years to come.